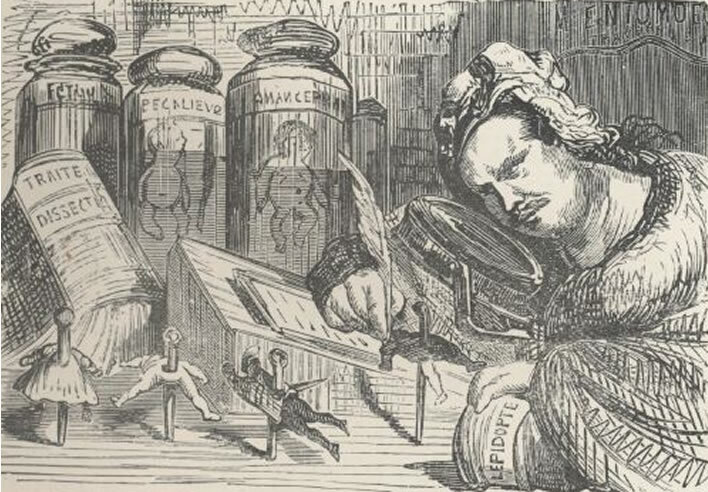 Gustave Doré's portrait of Rabelais the insect collector dissecting his human specimens (1894). On the whole then, since the Enlightenment, being called a 'fanatic' or being 'fanatical' was never a compliment. Today, in English, French and German the word has almost exclusively the meaning 'zealot'. Only lexicographers ('harmless drudges', pace Samuel Johnson) still remember the original Latin meaning and are happy to babble about its etymology (from fanum, 'temple'). Mykola Pymonenko (1862–1912), Victim of Fanaticism (1899), Kharkiv art museum. Fanaticism as Montaigne would understand it. The painting is based on an historical incident. 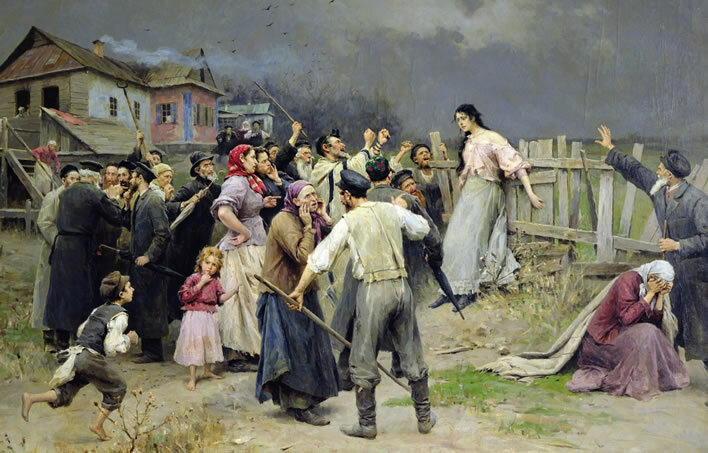 It shows the punishment of a Jewish girl by the Jewish community in Ukraine for her relationship with an Orthodox boy and her subsequent conversion to Christianity (she is now wearing a cross at her neck). A strange thing happened though in Germany during the Hitler years (1922-1945): the word 'fanatic' became a positive word. It changed its polarity, as it were. The Dresden romanist Victor Klemperer (1881-1960), scribbling notes at great personal risk throughout this period, has a chapter in his book LTI (Lingua tertii imperii - The Language of the Third Reich) dealing with this strange transformation of the word 'fanatic' from a repellant to a highly desirable thing. It was a transformation that began with a Frenchman who was often associated with the Enlightenment, but, as we have hinted elsewhere was never really one of those calm thinkers, but instead had frequent rushes of blood to the brain: Jean-Jacques Rousseau, an old enemy of this blog. Well, quite, Jean-Jacques. Frederick the Great, Catherine the Great, Napoleon, Bismarck, Lenin, Stalin, Hitler. They just need to be 'guided rightly'. Klemperer sees Rousseau's formulation as the birth of the doctrine of the admirable fanatic. For a while the impetuous and turbulent Romantic world that followed Rousseau kept close to the Latin meaning of fanaticism: enthusiasm, commitment, passion, the revolutionary ready to die for the cause. As such it was one element of social change and revolutionary struggle in the 19th century. But in the 20th century it became something much darker. Yeats noted it in 1919, as Europe – including Ireland – was coming to the boil on the way to the next disaster: 'The best lack all conviction while the worst/are full of passionate intensity.' Klemperer, pondering on the Rousseau fanatic, noted the moment 'its brother strode through the Brandenburg Gate in 1932'. It was the Nazis, they who rejected all non-German, non-Arian culture, who picked up 'fanatic', despite its completely un-German ancestry – perhaps even because it had no parallel in the German language and its negative French meaning of 'zealot' could be overlaid by the new meaning the Nazis wanted. This 'new' meaning was really an oldish meaning, because it was Rousseau's meaning, his words interpreted much more closely to the original than anyone had done before: utter, passionate enthusiasm without further thought. 'Never before the Third Reich had anyone thought of using fanatic as a positive word' writes Klemperer. In the early years of the Third Reich, before the propaganda vocabulary settled down, the Nazis used the word in both senses, but, quite soon, it became a word of the highest praise. From this one can infer with certainty that the true situation remained alive for twelve years in the consciousness or subconciousness of the people: namely, that a deranged mental state, bordering on pyschopathic illness and criminality, was all that time considered be the essence of virtue. The crazed Nazi 'fanaticism' disappeared almost immediately after the last gun fell silent. 'Fanatic' was restored to its pejorative place in German, a place it had kept in English and French. Even modern German dictionaries have purged the meaning of 'fanatic' of all traces of Nazi enthusiasm. Of course, the lone fanatic can be deadly, but is usually just a nuisance and a bore. In order to become anything more than the inmate of a lunatic asylum, the fanatic needs followers. In this case there will eventually be unrest – violent unrest, as there was in the birth years of the NSDAP in Weimar Germany. That was bad enough, but things become really dangerous when an administrative machine is available and the fanatic and the demented followers obtain access to its levers and dials, which is exactly what happened in Germany in 1933. The machine was there before the Nazis came. It was an administration with an ethic of order and obedience, the gift of Frederick II, the 'Great', the 'Old Fritz' himself, to his grateful subjects. Even great minds such as Immanuel Kant (1724-1804) fell for the old monster's magic. In Prussia, under the 'enlightened' Frederick, Kant wrote approvingly in 1783 that 'Enlightenment' means that you can think and write whatever you like, just as long as you obey the ruler. A century of organization, obedience and militarism had built the machine. When the Nazi fanatics arrived it was waiting for them, well-oiled and pitilessly effective. A great paradox confronts us. On the one hand we have a rapidly growing tribe of psychopathic fanatics: their heads full of hatred and a paranoid sense of betrayal, full of a corrosive longing for recognition and a seething desire for revenge for all the years of humiliation; people who were anything but calm and considered but whose minds would jump from one exigency to the next. On the other hand we have the relentless Prussian administrative organization. There would seem to be no common ground between the two, the fanatics and the careful administrators. Yet they married perfectly: the fanatics became the spooks in the machine, the administrators did what they were told to do and in time became fanatics themselves. The fanatic poison spread into the furthest capillaries of the German state. Klemperer was 30 in May 1912, when the 24 year-old Rupert Brooke (1887-1915) sat in the Cafe des Westens in Berlin, 'sweating, sick, and hot', as he describes it in his poem 'The Old Vicarage, Grantchester'. Two years later the world would be at war and within a year after that Brooke would be dead, on active service but brought low by a mosquito, not German ammunition. He became 'some corner of a foreign field / That is for ever England', in his case the Greek island of Skyros. Klemperer was also in Berlin around 1912, but probably not one of the temperamentvoll German Jews to whom Brooke took such exception. Klemperer would volunteer for military service as an artilleryman on the Western Front, just a few months after Brooke's death. He faced bullets and shells but lived to experience and survive the bombs of Dresden in 1945. In 1912 Brooke's patriotic, anti-German and antisemitic mind was in revolt at what he saw in Germany. What happened to Brooke's meads and hedgerows where das Betreten was not verboten? That's another story. Jean-Jacques is in that, too. ^ François Rabelais, Le cinquiesme et dernier livre des faicts et dicts héroïques du bon Pantragruel Chapitre XLVI - Comment Panurge et les aultres rythment par fureur poetique. p. 187. Et veu qu'il est de cerveau phanatique / Ce me seroit acte de trop piqueur / Penser moquer un si noble trinqueur. ^ Centre National de Ressources Textuelles et Lexicales (CNRTL): FANATIQUE, adj. et subst. Étymol. et Hist. 1. 1564 « qui se croit inspiré de l'esprit divin, pris de fureur poétique » (Rabelais, Le Cinquième Livre, éd. Marty-Laveaux, XLVI, p. 175 : il [Bacchus] est de cerveau phanatique); 2. 1580 « animé d'un zèle aveugle envers une religion, une doctrine » (Montaigne, Essais, éd. Thibaudet, II, XII, p. 600). Empr. au lat. class. fanaticus « inspiré, rempli d'enthousiasme; exalté ». ^ Oxford Shorter English Dictionary: 'fanatic'. ^ 'The Second Coming, l. 7. Michael Robartes and the Dancer in Collected Poems, Macmillan, London, 1965, p. 211. ^ Victor Klemperer, LTI, Notizbuch eines Philologen, Reclam, Stuttgart, 1975,2007, p. 82. ^ Klemperer, ibid p. 84. ^ Immanuel Kant, 'Beantwortung der Frage: Was Ist Aufklärung?' in Schriften zur Anthropologie Geschichtsphilosophie Politik und Pädagogik, Wissenschaftliche Buchgesellschaft Darmstadt, 1966, p. 55. Nur ein einziger Herr in der Welt sagt: räsonniert, so viel ihr wollt, und worüber ihr wollt; aber gehorcht! ^ Rupert Brooke, 'The Soldier' in The Complete Poems of Rupert Brooke, London, 1934, p. 148. ^ Rupert Brooke, 'The Old Vicarage, Grantchester' in ibid, p. 93. Grantchester, Haslingfield and Coton are villages in Cambridgeshire, England. Brooke lived in Grantchester for a time. ^ Adolf Glassbrenner, Bilder und Träume aus Wien, Ricola Verlag, Wien, 1922, p. 22f.